A couple of years ago, we talked about drug smugglers using catapults to fling marijuana into the U.S.
At the time, we suggested using catapults to throw stuff out of the U.S. Well, it turns out that a company in Virginia is wanting to do more than that. They want to use slingshots to throw stuff off the planet. No, I'm not making this up. It's a Kickstarter project, called the Slingatron. Only, it calls itself a "railroad to space," but it uses more of a slingshot concept than a railroad concept. 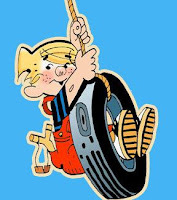 I'm not talking your Dennis the Menace kinda slingshot. I'm talking your David kills Goliath slingshot. The kind that goes around and around then is released with a FTHHPPTT! Will it work? I dunno. But, I'd like to see it throw something off the planet. Or someone. Let's start with Barack Obama. Next, Joe Biden. Then, Obama's cabinet. Follow that up with the Democrats in Congress, and then the people that voted for them. I'm thinking once we do that, we'll have worked out all the bugs, and the Republicans will get the idea that we don't mind tossing folks off the planet. Maybe they'll straighten up and act right. And, if they don't, we'll still need to test it some more, just to make sure it's working. But, that's just my suggestion. Who do you suggest we test this thing on? Who would you throw off the planet? There's a "The Moon Is a Harsh Mistress" reference around here somewhere, but I haven't read the book for years, so I'm not sure what that reference would be. It is all fine and well to want to "Nuke the Moon" but unless you have a plan to get the nuke up to the moon, it is just liberal wishful thinking about a utopia that will never happen. This could be the answer to HOW to nuke the moon, thus bringing the concept closer to reality. Sorry, Boo Boo. I know it's your parents' fault, but it seems this is the only way to get you off the TV. Michael Moore, if it can toss him off it can toss anyone. Well you already covered democrats, so john boehner, most journalists/propagandists, and hollywood are already among them. I wouldn't mind seeing the guy on our street with that really loud motorcycle get in line. Oh wait, that's me. how about a test shot with carpenter? It gladdens my heart to see that people still have aspirations. Your suggestions are so much better than cows or grand pianos as trebuchet ammo. perhaps there is hope still. Obama and all his regime need to be kickstarted right off the surface of the Earth and into orbit around the Sun, both as an object lesson to all who think like them that not only are they not the center of the universe, they are not even the center of our solar system, and as a warning to all who would visit our planet that, while we may be a tad slow on the uptick, we do indeed learn from our mistakes and eventually extract picturesque and exquisite vengeance on all who would subjugate us. Let all outsiders look upon us and despair. I read about a "space elevator" a few years ago. The idea seemed silly, until I read about it. The idea is actually from a century's old Russian sci-fi book - tether an asteroid or space station to the Earth in a geo-stationary orbit using an extremely strong and lightwieght cable, and have 'elevator' cars that can ride the cable up and down. The strongest material possible would have collapsed under its own weght, until few years ago when some researcher got a million dollar grant to research the feasability of it when material science was developing carbon nanotubes into fibers with tensile strength in excess of three times that of the currently strongest material, and at a fraction of the density of tungsten or Kevlar. That's one long elevator ride. Send the Wicked Witch of the West aka San Fran Nan. She is such an airhead she wouldn't need an oxygen supply. Poo -- at any invaders. I mean, come on, we're basically simian underneath it all. This could also be used to throw something against the side of a cliff (ala Roadrunner/Coyote) with humorous and final results. Just as much fun as throwing things into space, with the added benefit of being able to p!$$ on the remains afterwards.